It’s dawning on us that we’ve not just bought our dream cottage (yes, we got the keys just in the nick of time), we’ve also taken on an acre and a half of woodland. And an outbuilding that’s probably going to fall down in the near-ish future. But that’s all fine, because this is a great big adventure. We actually can’t quite believe our solicitor and mortgage broker managed to accomplish what seemed like an impossible task: get the whole sale completed within two months, before the Government bent us over for an extra £8,000 or so in stamp duty. So I’d like to recommend Amy at Express Mortgages. She’s some kind of a mortgage whisperer, I think. Tell her I sent you. And Mark Cooper at Brindley Twist Tafft & James Solicitors in Coventry. He appears to be a sorcerer of some description. They’ve both been absolutely amazing. Always go with recommendations, even if they’re slightly more expensive (in fact, these guys weren’t that expensive). In the end, they’ll pay for themselves. Plus your stress levels will be massively reduced. 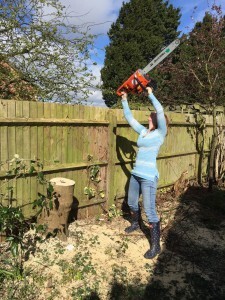 Disclaimer: this is a posed photograph with a non-fueled, non-running chainsaw. Do not, under any circumstances, use a chainsaw in this position. Or wearing jeans. Or in any way like this at all. M’kay? Good. Nasty, brutish and short – the life of a vacuum cleaner.